Come and join us and learn the glamourous art of burlesque! 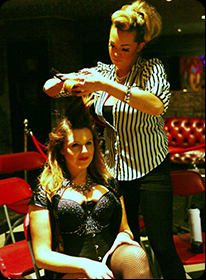 Platinum Pole Parties present to you burlesque courses for girls of ALL ages! That’s right all you nannas, mammas and daughters are now able to join in, learning the age old art of striptease whilst bringing out that inner showgirl in all of us. We have teamed up with Brighton’s one and only “La Bordello Boheme” to give you girls a real chance at performing on stage with real professionals. We will work with you, choreographing routines which will then, if you choose, be brought to the stage and performed in front of your friends, family, loved ones, or of course a special someone. So join us now for this 6 weeks course as we transform you into stunning sirens – unleashing your inner beauty and core confidence as well as your outer beauty including costume tips and hair and makeup as we prepare you to perform alongside some of the best artists in the business! Plus, don’t think we’re not interested in catering for all, as we also offer courses designed directly for all you boys wanting to show off that inner woman inside of you. Also, if you’re yet to feel ready for the showdown or simply wish to join just for you, you can sign up for our one2one classes or get in early and join up for our next course in the near future. Suitable for all, including non dancers, beginners as well as professionals. Come down to our Monday night classes at Brighton’s Funfair Club, Central Brighton from 7:30pm-8.30pm for the ladies and Tuesday 7pm-8.15pm for the boys. The courses will run every 6 weeks so get in touch to see when our next courses start. You will learn a choreographed routine that will be burlesque inspired with a modern take. We will also personalise each person to the routine. Some girls will be more daring than others and that’s completely fine especially if your new to burlesque so we will push you only as far as you wish to be pushed. The best part of this is that at the end of the 6 weeks course there will be a “La Bordello Boheme” Show which will feature you girls. This will be on February 13th 2014. Again not everyone will feel ready to be in the show and some girls just want to come along as the classes are fun and help women become more confident and also a great hobble. The classes will be held at The Funfair club as will the show. The venue isn’t huge which is actually lovely as we will turn it into a really cosy speakeasy-type venue which will be perfect for beginners and stylish enough for professionals. Come see for yourselves just how wonderful it is to be a woman and what a marvel it is to be a man as you bask in the beauty of true burlesque. Rent one of our free standing poles for your own home, nightclub, boat; anywhere and we will deliver and set up for you to ensure your safety and convenience, then collect and dismantle.